[…] Farocki has also noticed for us how prisons and supermarkets, video-games and theatres of war have become ‘work-places’ – of subjects as much as of commodities. They are spaces that are converging, once one appreciates how they all fall under the new pragmatics of the time-space logic of optimising access, flow, control. These sites a filmmaker has to take cognisance of and recognise him/herself implicated in, but so has the spectator, whose role has changed so much. As one walks through Farocki’s works, which have become our worlds, one realises that he may be one of the few filmmakers today capable of understanding the logic of this convergence, contesting its inevitability and yet feeling confident enough to continue to believe in the wit, wisdom and the poetry of images. This certainly makes Harun Farocki an important filmmaker: probably Germany’s best-known important filmmaker. Inspired by Farocki’s films — which seem more and more relevant to our daily lives — as well as by Elsaesser’s many perceptive words about them, Film Studies For Free wanted to publicize the ongoing exhibition “Harun Farocki, 3 Early Films” at the Cubitt Gallery, London (17 January – 22 February 2009), as well as the surrounding events to be held at the Goethe-Institut and Cubitt Gallery (31 January-20 February). ‘The Cinema of Identification Gets on my Nerves: An Interview with Christian Petzold’, Cineaste, Vol. 33 No.3 (Summer 2008). the ways in which Latin America has figured in Hollywood and European cinema. Rather than lamenting the distance between stereotype and reality, it is interested in the functions served by the innumerable projections of fantasized Latin Americas onto the silver screen. This website – Projections – was founded in 2005 by the renowned Latin-Americanist scholar Jon Beasley-Murray, currently Assistant Professor in the Department of French, Hispanic, and Italian Studies at the University of British Columbia, Canada. As his university website testifies, Beasley-Murray is a longstanding practitioner and exponent of Open Access scholarship with numerous of his excellent publications archived online. He is also author of the important weblog Posthegemony. Projections‘ project is to write about Hollywood and European movies ‘in which Latin America plays a part, however small’. Beasley-Murray asks: ‘Is there some shared element beyond the contingent commonality of location or theme? My wager is that there is, and that it’s something worth writing about. Indeed, my suspicion is that when Hollywood goes Latin, it reveals something essential about cinema tout court.’ The index by title of the many films so far examined can be found by clicking HERE. The idea is in large part to get beyond the ghetto of closed, proprietary educational software (WebCT and the like), to give students a sense that they are producing research on a public stage, and to integrate their learning with their own real world experience of the internet. Important work, indeed. 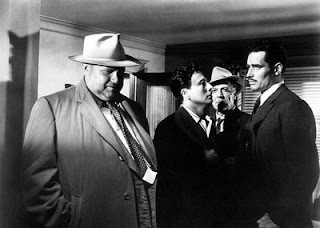 To conclude its celebration of the achievement of Projections, Film Studies For Free decided to drill down and produce an extensive series of high-quality, online-resource links pertaining to one of the films studied on that blog (and a great favourite of this blogger, too): Orson Welles’s 1958 Touch of Evil. The list is headed by Projections‘s great entry on this film. Also see the wonderful Wellesnet, the Orson Welles Web Resource, together with its sister project The Museum of Orson Welles which continues to ‘compile and present the available radio and recorded works of Orson Welles’. Film Studies For Free is happy today for lots of reasons but one of the two chief explanations is that there has been a positive development in the case that this blog has been harping on about for a wee while now (see Shooting Down YouTube: Bring Back Kevin Lee’s Videos! and L’Affaire Lee: follow up links). Thanks to the Copyright Team at YouTube for getting into the spirit of Martin Luther King Day, and agreeing to temporarily reinstate my account while my counterclaim against INA over the fair use of “…And God Created Woman” is under review. And thank you EVERYONE for your emails and messages of support, and for those who wrote about my ordeal on their respective websites. The publicity surrounding this mess had everything to do with YouTube contacting me last Friday and offering guidance on what steps I needed to take to get my account back online (at the time I didn’t know how I could still file a counterclaim despite [the fact] that I was shut out of my account). A temporary respite only, it should be noted, but at least it means that Lee’s YouTube channel is mostly back online, including many videos that weren’t in dispute at all (OK, OK… So FSFF knows that it’s not the most serious instance of collective punishment going on in the world right now but it certainly was a disproportionate response in its own way…). Lee has also posted the putative ‘offending’ video (Shooting Down Pictures #932: And God Created Woman) on Veoh.com, so check it out there, along with three other great video essays of his (Hour of the Star, O Lucky Man, and Seventh Heaven). Now Film Studies For Free is off to find a television set to which it can glue itself gleefully for the rest of the day, but please feel free to enjoy this link in its absence. Film Studies For Free rather angrily sounded off, the other day, on the case of the deletion of the YouTube account of Kevin B Lee, and then, much more calmly, listed lots of links to information about and discussions of the issue of fair use of (or fair dealing with) copyrighted materials for non-financial profit, educational purposes. As Patricia Aufderheide so appropriately puts it, in the video embedded above, the whole business is a ‘very sloppy and messy beginning to a new way of making culture and making media’. And mess is, as the work of David Trotter has informed us (see p. 12), a frequent characteristic of transitional objects . But where might we be headed après la transition (and après l’affaire Lee)? FSFF would like to follow up on a few thoughts provoked by Scott Macaulay‘s article, in particular. At the end of the day, as distressing as this is to the blogger community individually, I think the best way forward is to link what’s happened here to the broader debate over fair use as it applies in documentary film, in classrooms, and in the kind of “remix” works [Lawrence Lessig] talks about in his new book [Remix: Making Art and Commerce Thrive in the Hybrid Economy (2008)]. There are people who have been invested in these issues for years, and the voices of the online critical community should now be added to theirs. Definitely worth checking it out. Thanks Nina (see also her blog). >Shooting Down YouTube: Bring Back Kevin Lee’s Videos! Today is a b a d d a y for free online film studies, as Karina Longworth and Matt Zoller Seitz have both ably reported. And thus it’s a pretty terrible day for Film Studies For Free. You see, dear readers, there are holes in this here blog, gaping ones where Kevin B. Lee‘s marvellous video essays used to be embedded. Innocently. Not for financial profit. Solely for your film-educational betterment… such is Film Studies For Free‘s humble raison d’être . Lee is a filmmaker and multimedia producer based in New York City. Shooting Down Pictures primarily serves as a repository for a wide variety of materials connected with his project of viewing every film on the list of 1000 greatest films of all time, as compiled by They Shoot Pictures, Don’t They? Rather than simply writing about, or gathering pre-existing resources together for these films — both of which Lee does brilliantly, it must be said — he also makes video essays about them and commissions others to provide their own audio commentaries, including ones by such luminaries as Nicole Brenez, Jonathan Rosenbaum, Paolo Cherchi Usai, Richard Brody, Karina Longworth, Andy Horbal, Mike D’Angelo, Matt Zoller Seitz, Preston Miller, Vadim Rizov, and Girish Shambu. Yesterday, in Uh oh… Storm’s brewing… and The Storm has Hit, Lee informed his loyal readers that his YouTube account, where the videos were publicly archived, had been ‘permanently disabled’ due to an INA (presumably Institut national de l’audiovisuel?) claim that the following material was infringing copyright: Video Essay for 932. Et dieu… crea la femme / …And God Created Woman (1956, Roger Vadim). It seems that YouTube has removed all 70 of Lee’s videos, including 40 of his original video essays. As Film Studies For Free‘s normal stock in trade is cheerful and positive commentary, it doesn’t usually find itself getting angry. But this news made it fume, and sent it off to the e-barricades! It couldn’t agree more with some of the readers’ comments about YouTube’s actions, linked to Longworth’s post, which are, therefore, worth citing here. Film Studies For Free wishes to express its solidarity with Kevin and really hopes that something can be worked out quickly to get his inspirational video essays back online. But its readers might like to join with it as it prepares itself for what will almost certainly be a much longer fight in defence of Fair Use, and in the pursuit of more Open Culture and more Open Access scholarship. The Organization for Transformative Works (cited by Jenkins). Patricia Aufderheide’s brilliant 2008 post Political Remixers and Fair Use Best Practices (also cited by Jenkins). Duke University’s Center for the Study of the Public Domain has lots of great links about copyright, fair use, and intellectual property issues. See also FSFF‘s post Documentary filmmaking and intellectual property law: free e-book and short films about the Center for the Study of the Public Domain. Both questions touch on, among other things, the question of whether the use will cause excessive economic harm to the copyright owner. Another consideration underlies and influences the way in which these questions are analyzed: whether the user acted reasonably and in good faith, in light of general practice in his or her particular field. P.S. FSFF urges you also to take in the following, probably highly prescient, words by Luke McKernan, commenting on a different issue, over at the great new Screen Research blog (FSFF will write more about this site very soon): ‘I think the story of 2009 is going to be the undermining of YouTube, as services based heavily or exclusively on commercial content – Hulu.com and now CBS’s TV.com – come galloping up the rails, while YouTube staggers along, burdened by too much user-generated content’….. Shooting Down YouTube: Bring Back Kevin Lee’s Videos!